Last year I had the privilege to speak in front of a great crowd at New Media Europe about podcasting in seasons. The reception I received on the topic was amazing and, even now, I’m tagged regularly on social media by people who are putting it into action. 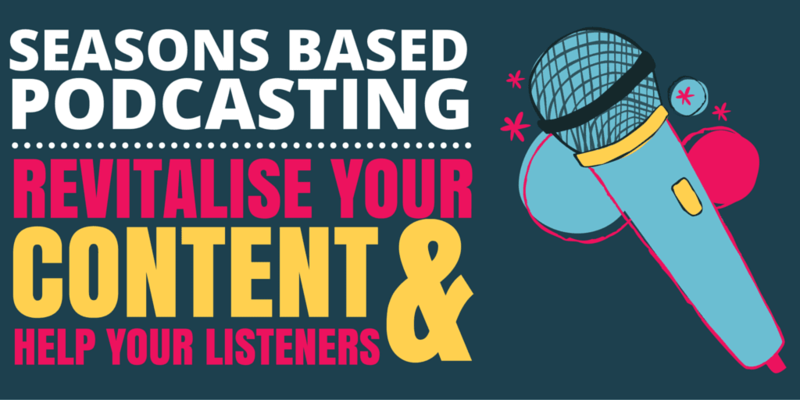 I talked about how the format works, and how it can be used to revitalise your content. The idea that really jived with the audience was how it can be used to make content creation much easier for you, and much more effective for your listener. I’m a season-format fanatic. I don’t do it on every show I produce, but I do do it on most. Want to know why? Let’s take a look! Who Might Try Podcasting in Seasons? Firstly, seasons-based podcasting is really effective for anyone who does at least a little bit of teaching on their podcast. I don’t mean teaching in any kind of formal sense. I just mean that you talk about your expertise and you help people to learn a little along the way. Next, it can also work really well for an entertainment-based show. If you do comedy, games, sport, whatever, the benefits for you that I relate below will heavily apply. The main niche it’s not so good for is current affairs & news, for reasons you can probably guess. These types of podcasts rely heavily on last minute planning to ensure that the podcast is up to date with the latest happenings. That means seasons are pretty hard to plan. In saying that, though, you might find some of the benefits still apply. Sit down and think of a topic you’re often asked about. Break the topic down into individual lessons. Think about discrete elements within that topic. How would you teach it to a complete novice? Amanda comes up with the following: a. The growing calendar, b. preparing the ground, c. root vegetables (carrots, potatoes, etc), d. leaf vegetables (kale, spinach, etc), e. …and so on. Roughly map out each episode with some high-level bullet points. This gives you an outline for the content of each episode, allowing you to plan the lessons and also acting as a script when it comes to recording time. And you’re done – the season is designed. You’ll end up with a plan for the whole season, and rough bullet-point scripts for each individual episode. I can carry out that process in about an hour, or maybe 2 for a longer season. What if I do Entertainment? If you do an entertainment show, you might not be asked questions on a regular basis. But, this can still work for you. A great approach in this case is to ‘theme’ a season. If you do comedy, for example, you might do a season called ‘The Poser’s Guide to…’ like Masters of None used to do a few years back. You pick out a series of topics you want to cover, maybe even ask for listener input on the break, and then plan it out. It creates a narrative that draws people through the series and still gives you the benefit of congruous content, without the teaching. Or, perhaps you cover computer games. In that case you could do a season called ‘Games from our Childhood’. You can cover a new one each week, teasing them early on to build hype. The key thing is that the episodes are related and easy to plan out as a series. It doesn’t matter what topic you cover. There’s nearly always a good way to incorporate seasons in a way that’ll help both you and the listeners. A season should be as long as you need it to be, and no more. Some of my seasons are only 5 or 6 episodes, because I could cover the topic in that number. Others have been 20 episodes long. Think about discrete topics, and split it up into the component parts of the main subject. For example, Amanda wants to talk about root veg on a separate episode to leaf veg, because they’re quite different things. But the growing technique for carrots and potatoes aren’t quite different enough to differentiate them, so ‘root veg’ is a good base lesson. Why’s this worth it for you, the producer? Rather than coming up with a new topic every week, you’re following a plan over a number of months. That bullet point outline is available, every week, and makes it so much easier to sit down and record. You’re no longer just ‘going through the motions’ when you record. You know where you’re going, you have a purpose, an end in sight, and you feel progress towards that goal: the completion of the season. I always feel far more motivated to record when I’m working my way through a season, as opposed to stand-alone weekly recording. When you’re doing seasons, it means one simple thing – you get to take a break! The thing is, weekly podcasting is great in the early days, and is still mostly great in the later days. But, that weekly treadmill of content does begin to grind you down. Introduce a break every few months, though, and it all changes. You get a few weeks in between seasons to recharge and then to get excited about the next. One of my favourite things about seasons is that it creates these clear ‘review points’ throughout your podcast career which encourage you to mix things up and evolve as you go. At the end of a season, I encourage every podcaster to survey their audience. Ask your listeners what they enjoyed and what they didn’t. Ask them what they want to hear on the next season. Ask them about the format, the hosts, the topics. Ask them how you can get better. That info is invaluable and it’ll guide you in how to change things up for the next season. Only by sourcing feedback and using it to evolve can you be sure you’re constantly improving. An unexpected benefit of seasons, for me, was the gradual build-up of highly authoritative evergreen resources. I think I realised this was happening at the end of my 3rd season. I was around 40 episodes in by that point and I suddenly noticed that I had 3 big collections of episodes, covering 3 of the biggest problem areas of podcasting. I started to refer people to the seasons themselves, as if they were a course or an audio-book of their own. At that point I started to release individual seasons on iTunes too, reasoning that it would be good to allow people to consume that entire season as a stand-alone resource. It certainly worked, and I’ve developed a few of my seasons out into full courses now. That means adding extra lessons or deep dives, along with video, text and activities. These courses are part of our core offering at the company now, and all evolved from an original podcast season. The best bit is that this isn’t just good for you, it really benefits your listeners too. Remember when you were at school? How did the teacher organise your lessons? That wouldn’t make any sense – the teacher is mixing up really advanced material with total beginner’s material, and they’re jumping around subjects like crazy. But, the thing is, that’s exactly what a lot of people do on their podcast. They start a new topic every week, and they mix up the levels entirely, episode after episode. It’s not an effective way for anyone to learn, or even just to follow along with your story. Leading on from the last point, say someone DID want to learn from you and was interested in a sub-topic that you cover. How would they find all of the info you’ve released on that topic? Take Amanda again: if she did a normal podcast, she might talk about vegetables every now and again, but not in a structured fashion. The listener could search through Amanda’s back catalogue, searching out all of the vegetable episodes they can find. But it makes work for them. It’s not easy, even if you use Categories and Tagging to at least bring together episodes around a theme. It’ll lead to an unorganised list of shows, mixing up the levels and the order, and it generally doesn’t help them out very much. A season, though, is something that’s purposefully organised, and something listeners can always go back to. You can link to your season on ‘vegetables’ at any time, and your listeners can go back and listen through the entire series as if it was an audio book. That’s one thing that encourages a binge listen, and that’s something which creates fast, fanatical fans. Okay, I’ll admit it’s not all roses. There are a couple of downsides. The biggest downside for me is the reduction in flexibility. I often have the opportunity to interview someone great for Podcraft, but I’m in the middle of a season which is totally unrelated to their subject. That means either squeezing them in, slightly randomly, or waiting until a new season which may be related. The way I get around this is to do interviews on my season breaks. I’ll pick up interviews during a 2 or 3 month season run, and then I might release them during the month or two that I take off. That means I’m actually not taking a full break, which is slightly cheating, I know, but it works for me on occasion. If it’s something I really want to get out there, I’ll just take a break from the season for a week and put it out. I use categories within WordPress to manage my episodes, so you can still make it easy for anyone to go back and listen through a season (one category) in sequence, not seeing the ‘in-between’ episodes. Alternatively, if you just want to put some timely info in there – perhaps news related or personal – or some non-season related material, you can just put it in at the end! That means the main episode is completely evergreen, until you get to the last few minutes. When people go back and listen at a later date, they can always just skip to the next episode once they reach that segment. This is always the fear in doing seasons. Or rather, it’s the fear in taking a break between seasons. Everyone fears they’ll lose listeners while they take a month off. It’s true – if you just take a month off, then you will. Although probably far fewer than you expect. This is really easy to mitigate, though, with this piece of simple advice: communicate! Tell your listeners what’s going on. In the season finale, let them know that this is the last episode for a while. Then tell them exactly when you’ll be back. If you’re clear on this, and make it obvious what’s going on, you’ll lose very few people along the way. Something I often do at the end of a season is to record a short end-of-season signpost, and release that onto my feed. That’s the most recent episode and so it’s the one that downloads first if someone new subscribes to the show. I explain what’s going on in there, and I’ll signpost all of the previous seasons, hoping that I encourage them to start listening to the back catalog. I also make the title of that episode really clear, something like: “End of Season 5! We Return on May 29th”. That means potential new listeners wont be put off by looking at the dates and spotting that nothing’s been released for a while. Conclusion – Test it Out! I hope that’s given you an idea on when you could try out a season approach, and how you might go about it. I know, from my own experience, that there have been a huge number of benefits. Not only the motivation aspect, but the evergreen resources that emerge and which I’ve gradually turned into courses. I’d love to hear what you think though. Drop your answers to the following questions in the comments below. Do you podcast in seasons? Why? What’s your favourite seasons based show? Love this idea! It’s helping me focus. My show will mostly be interview based, but even that’s totally amicable with seasons! Thanks for the great tip. lots of great info -thanks. Can’t wait to get started – what fun !